First I have to apologize for the lack of step by step photos of this recipe. I had no idea it would turn out as good as it did and I was pretty jaded going into the recipe preparation. The recipe was from of my long owned cookbooks, Not Your Mother’s Slow Cooker Recipes for Two. I’ve wanted get rid of this book on a number of occasions, but really, how often do you find recipes for a slow cooker that serves two rather than a family of twelve? The last time I used this book was at least 3-4 years ago. It was a delicious looking recipe for pork tenderloin with a rhubarb chutney. I prepared the ingredients accordingly, set my crockpot and left for work. When I returned 8 hours or so later, wonderful aromas drew me down the hall to my apartment door. I was hit with the beautiful scent of rhubarb as I turned the key. My mouth watered and I couldn’t get to the kitchen fast enough. When I opened the pot, however, I was welcomed not by a tasty tender piece of pork but a dark, salvageable charred mess. How the char and burnt scent didn’t fill my apartment is still a mystery to me, but that dish still remains my most disappointing cooking experience ever. To walk into the illusion of a perfect meal, only to be slapped in the face by it’s ruins. We had pizza that night and I haven’t touched the book since. However, in light of my resolution to make at least a recipe from every cookbook I owned this year, I was ready to try again. The pain had almost healed, but I was still skeptical and never expected to share the recipe with you. How very wrong I was. 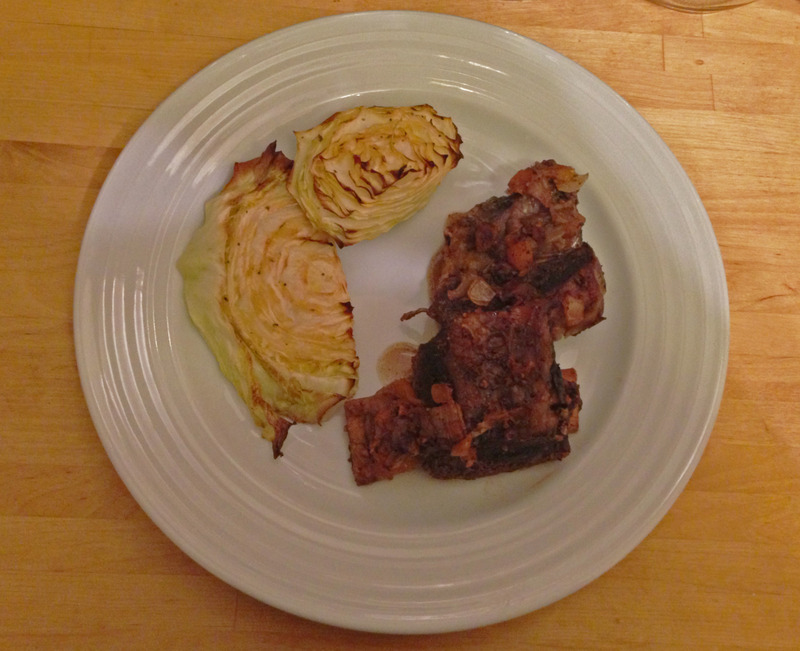 The short ribs were tender and most, many off the bone already when I returned home that evening. The sauce was reminiscent of an Asian inspired sweet and sour sauce. With this one recipe, the memories of my rhubarb pork tenderloin vanished and I was eager to welcome this book back into the regulars (I have a collection of frequently used cookbooks in my kitchen, the rest scattered on shelves all around the apartment). It taught me, maybe I shouldn’t be so dismissive of a single recipe, maybe I should trust more. And maybe, one day, with some of my own tweaks, on a beautiful spring day, I’ll even attempt that rhubarb recipe again. Combine wine, onion, garlic, apricots, mustard and salt in a small bowl and mix until well combined. Arrange short ribs in the slow cooker and pour sauce over them, making sure apricots and onions are well distributed. Cover and cook on low for 8 hours. Transfer ribs to a platter and set aside. Cool sauce until fat congeals on the surface (I usually pour sauce into a small bowl and store in the fridge for an hour or so to speed up the process). Slim fat and discard. When ready to serve, Spread ribs evenly in a baking dish and pour sauce over. Reheat ribs at 300°F until hot, about 20 minutes. Serve immediately with a side of roasted cabbage.